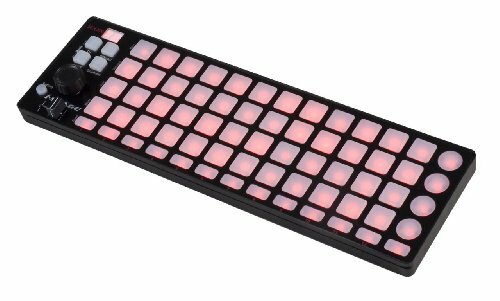 The Icon i-Stage is a multifunction matrix controller featuring a grid of 48 velocity sensitive dual color buttons. As the name suggests, the i-Stage was designed for performance and includes four control modes: DJ, Effect, DAW, and Drummer. In Ableton Live, the DJ mode controls clips, Effect mode controls devices, DAW mode controls the mixer, and Drummer mode controls the Drum Rack. All four modes can be used in any DAW or DJ software. In addition to the button grid, there are 17 assignable backlit buttons, a horizontal slider that can be used to crossfade between two tracks, a rotary encoder, and a shift button for additional control layers. The i-Stage comes bundled with Amplitude and includes factory presets for most popular DAW and DJ software including Traktor, Ableton Live, Cubase, Nuendo, Logic Pro, Pro Tools, and Studio One. Every control can be custom-mapped to any MIDI application using the included iMap software. The i-Stage uses Mackie Control and HUI protocols for presets and automatic mapping, and can be configured for general MIDI values as well. Novation LAUNCHPAD MINI MK2 MKII USB MIDI DJ Controller 64-Pad+Free Speaker !